Those living with, through and beyond cancer continuously seek and hope for cure and healing of their predicament. Modern science provides hope for the cure and those dedicated to finding cure for cancer are ever exploring the possible and other frontiers. Healing is another regime needed by those living with, through and beyond cancer. What we see, do and experience as programs and activities of support may be related to the healing processes of challenges faced by cancer survivors. They need care as part of healing process. 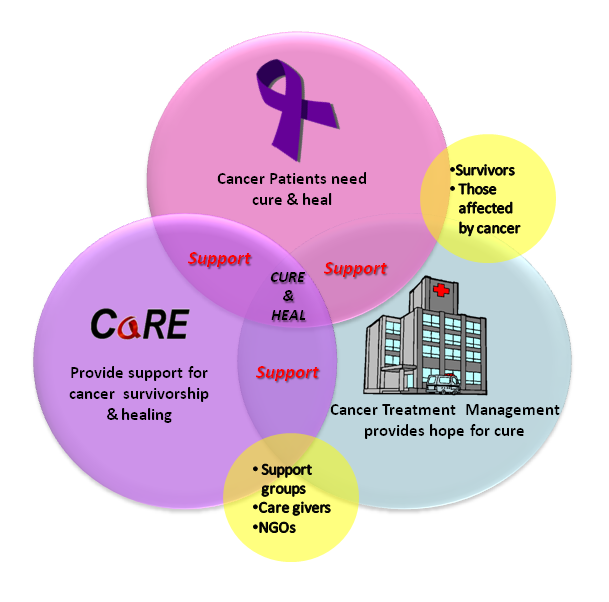 At CaRE we develop programs, events and activities such elements of motivation, spiritual discourse, gardening and healthy lifestyle activity as means of therapies to support the process of cancer survivorship and healing. CaRE aspires to be the frontier leader in providing these kinds of education, information and support. We have established a number of initiatives related to healing and survivorship since 2003. We have been able to provide such services because of financial support and contributions from our anchor partners. Since 2003, education, information and support programs and activities at CaRE have been operating in an autonomous nature. Therefore, CaRE requires a continuous funding to maintain the operation and development of such programs and activities. Caring Beyond Fund is created to fulfil the aspiration to sustain and move forward our education and support programs. It is essentially operational based on the community engagement concept that we work on engagement as “the process of working collaboratively with relevant partners who share common goals and interests” (Tindana et al, 2007). Engaging corporate community to be partners in our effort to educate and support those living with, through and beyond cancer. Developing financial capacity that our initiatives, programs and activities can be: (1) Sustained to support, educate and inform those affected by cancer; and (2) strengthened to have impact on wellness and well being of the beneficiary. CES CaRE requires a continuous funding to maintain the cost of operation and development of CaRE’s programs and activities.